Roanoke, VA - March 2019. 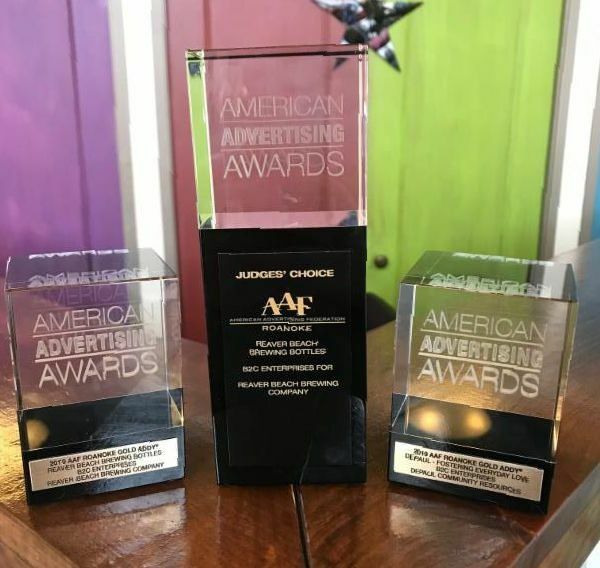 Three ADDY awards were presented to B2C Enterprises on Saturday, March 2nd at the Western Virginia Division of the American Advertising Federation ceremony, also known as the ADDYs. The full-service marketing and advertising agency was recognized during the event held at Charter Hall in the historic City Market Building in downtown Roanoke. The ADDYs are the industry's largest competition and is built to recognize the creative spirit of excellence in the art of advertising. "There's a lot of talent in our area and I love getting the chance to see it all on display," said Aaron Kelderhouse, Creative Director of B2C Enterprises. "Some of us may be competitors in the business, but on nights like the ADDY Awards, that concept takes a back seat. The event isn't just an opportunity to revisit some of the work that makes me so proud of our team, it's also a chance to really appreciate all of the creativity that flows through the region." Kelderhouse's custom illustrations for Reaver Beach Brewing Company's bottled craft beers won a Gold Award in Packaging Campaigns. His designs also earned a coveted Judge's Choice Award. B2C Enterprises then won a Gold Award in Integrated Media Public Service Campaigns for its 2018 commercial and print work for DePaul Community Resources, a non-profit organization dedicated to fostering hope and love for children and teens in Southwest Virginia. "This campaign quickly became so precious to all of us who worked on it," said Molly Doyle, Graphic Designer and Director of the DePaul Community Resources production. "It was really important for us to see it succeed. We're proud to have been recognized for our work creatively, but we feel like the real win came from seeing this project open doors for our friends at DePaul. All in all, this campaign was rewarding from start to finish." This year's recognitions make for a total of thirteen ADDY awards won by B2C and its creative team for their efforts. Previous winnings include awards for radio and television commercials, poster campaigns, and print advertisements. To learn more about B2C Enterprises, view the award-winning campaigns, or see a full list of the services they provide, visit www.b2cEnterprises.com.